Big Sky is literally surrounded by mountains. This small town that is close to everything is nestled in the middle of Montana's Madison Range - a mountain range that stretches 80 miles north/south by 25 miles east/west. With mountains in every direction, Big Sky is the ideal place to go backcountry skiing. Backcountry skiing is defined as skiing outside of the ski area boundaries. There is no avalanche control, no ski patrol, no crowds, and no lifts. It's a form of human powered recreation where mountain adventurers head out into the wilderness to earn their turns in wild snow. It's not for everyone, but it's certainly an exciting adventure for those who are keen. 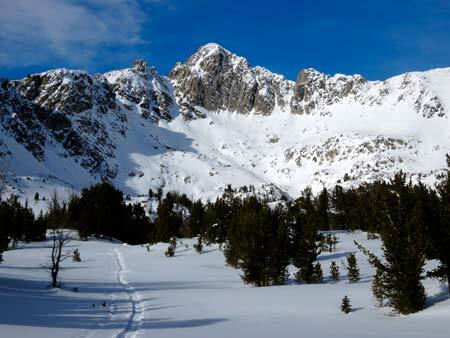 Beehive Basin - Beehive is one of the most popular locations for backcountry skiers and snowboarders in the Big Sky area. Starting at nearly 8000', skiers and riders of all abilities will enjoy the terrain accessed from the Beehive Trailhead. It's a classic destination that provides easy access to stunning terrain. Telemark Meadows - Located 30 miles south of Big Sky in Yellowstone National Park, Telemark Meadows is an ideal place to explore the backcountry safely. It typically has a deep snowpack, low angle runs, and short vertical. It's a great place to make a few powder laps and enjoy the quiet of the backcountry. Yellow Mountain Meadows - Located near the town of Big Sky, Yellow Mountain is a great spot to get some quick vertical and earn a few good turns in some lower angle terrain. Pick up a copy of Ben Werner's Backcountry Skiing Bozeman and Big Sky to learn more about these routes and to discover even more backcountry ski destinations in the Big Sky area. The mountains are endless and are meant to be explored. Please enjoy them safely. Unfortunately there are NO guide services in the Big Sky area that can take people backcountry skiing. Feel free to ask around at some of Big Sky's outdoor stores for local knowledge and advice, but realize that you are on your own in the backcountry, so always be prepared. At an absolute minimum, all backcountry skiers need to have an avalanche beacon, shovel, and probe before they even consider going backcountry skiing. It's wise to go with someone you trust with your life and even better to take an avalanche course before you venture out. It may also be smart to get your uphill legs in shape by taking advantage of Big Sky Resort's uphill skinning opportunities. If you're heading out, be sure to check the Gallatin National Forest Avalanche Center's daily avalanche forecast at www.mtavalanche.com. Also don't forget to check the Big Sky weather forecast. 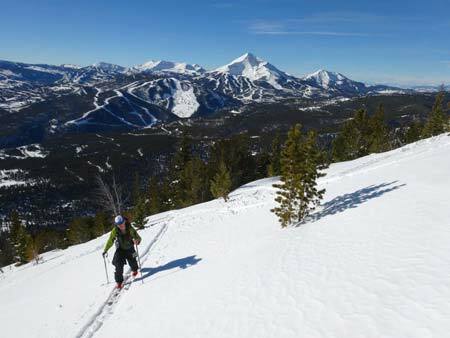 Are you ready to go backcountry skiing in Big Sky? Have fun and be safe!